Me in Costa Rica, 1996. Do you know what the best day or your life is? For many years, I said that December 24, 1996 was the best day of my life. 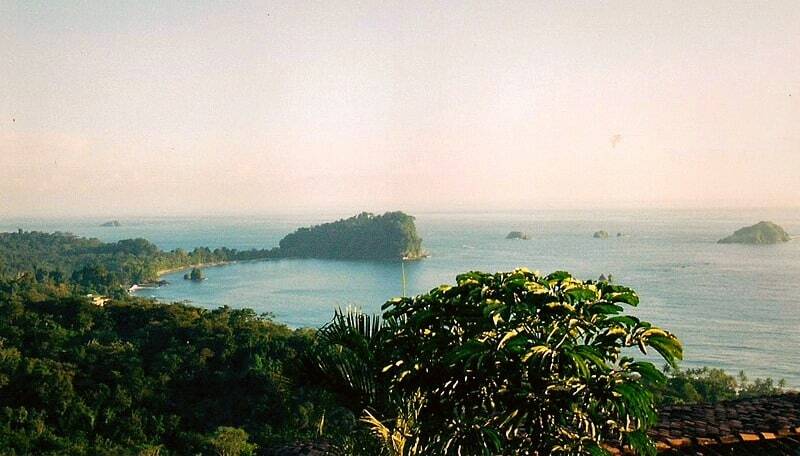 On December 24, 1996 I woke up in a tiny hut in the jungle in Costa Rica. I was with my fiance at the time, Kirk, on a two-week vacation. We looked out that morning through the screens that served as walls to see the trees filled with white-face monkeys. The tiny eco-resort was built right into the jungle using natural materials and no electricity. It was rustic and comfortable and as immersed into the natural world as possible. There was a thatched-roof beach bar that whipped up fruity drinks using a blender attached to a car battery. The dining room was simply a platform with a roof. The screened-in huts were scattered around the property to ensure privacy. In other words, the entire place was designed to interfere as little as possible with the natural environment, which made the indigenous animals, like white-face monkeys, feel safe and welcome. I started keeping a list of the wildlife I saw on that trip. And many of the most spectacular sightings took place on December 24. 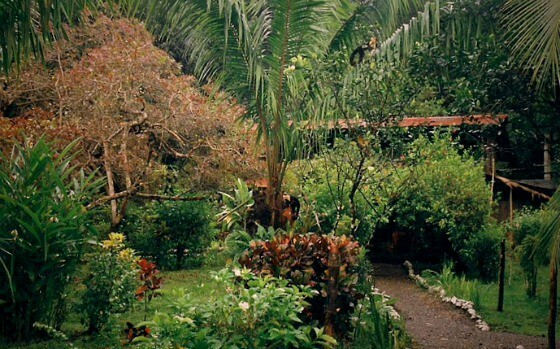 Our jungle home — an ecolodge in Bahia Drake, Costa Rica, 1996. That day we got up early to go on an excursion with a local guide named Gerhardt. A lean man with a rough-shod look, Gerhardt was originally from Germany, but had been in Costa Rica for many years — and I got the impression that somehow the move had saved his life. Also along for the trip was Eddie, a Harrison Ford lookalike from the USA who worked as a park ranger in Yellowstone. He was a handsome, romantic, wild man, tramping around Costa Rica in flip-flops, sleeping in a tiny tent, and nursing a broken heart. The four of us went out across the ocean in a small boat until we reached Cano Island. This emerald dot in the Pacific is the island you see in the film Jurassic Park. It’s a very special, very mysterious place; a living museum that was for a thousand years the burial place of kings. The shallow graves had long been looted for their gold treasures — some of which are in the gold museum in San Jose — but it is still fascinating to see the grave sites and bits of pottery. Gerhardt told us that because of this desecration, the island was haunted. In the morning we hiked around the island, to the highest point, where I took photos of all of us and the spectacular view. We saw “Jesus Christ lizards” (so named because they walk on water), scarlet macaws and giant blue morpho butterflies. As we walked, Gerhardt shared his prodigious knowledge of the flora and fauna, telling us about things like the vines that wrap around trees and slowly strangle them. After a delicious lunch of rice, beans and fresh tropical fruit on the beach, we went snorkelling and saw masses of colourful fish. 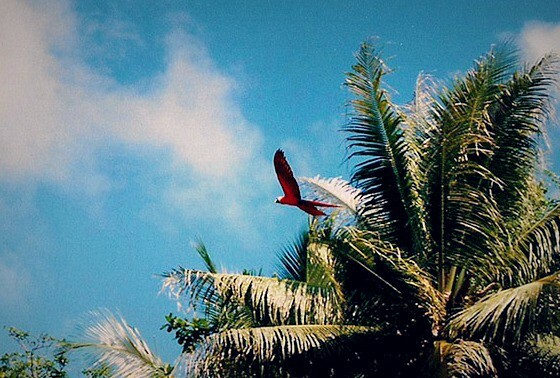 Scarlet Macaw, Costa Rica, 1996. On the way home, Gerhardt relaxed the rules and shared some beer with us he had chilling in a cooler, and then he put some deep-sea fishing rods in the water and I caught a small yellow fin tuna. On the way back we saw flying fish and a school of dolphins. That night, we invited Eddie to join us at dinner, and the resort had made the tuna into sashimi for us. I experienced the profound feeling of catching my dinner and eating it raw, which I found primal and deeply satisfying. Afterwards, Eddie, Kirk and I walked through the jungle to a community centre where the locals were having a Christmas Eve dance. We kicked off our hiking boots and hit the dance floor with the locals. On the way home through the very dark jungle, we came across a chic resort with an open-air bar and stopped for drinks. Finally, we ended up sitting together on the beach as the surf roared and crashed under the full moon. I had never felt so alive, never had a day so full of adventure, surprise, friendship, and wonder. I was doubly thrilled that I had my new camera with me, my Christmas gift from my fiance, who had given it to me early so I could capture the beauty of Costa Rica and our trip. I had the entire day on film, to remind me of how amazing life can be. 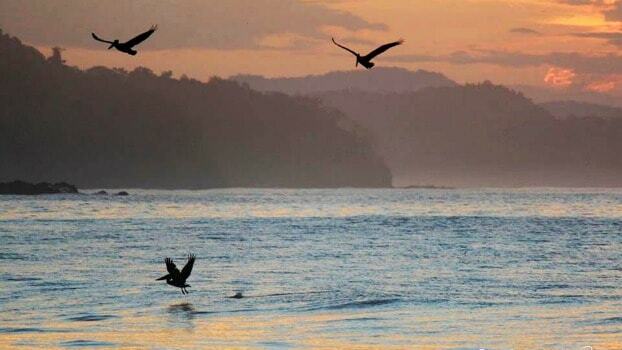 Manuel Antonio, Costa Rica. 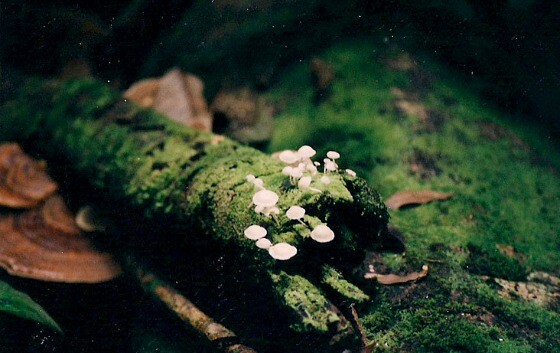 A photo I took with my new film camera in 1996. When I got home, I took all 11 rolls of film I shot in Costa Rica in for processing and they all turned out great … except for the one taken that day on Cano Island. The negative roll was completely blank. Instantly I remembered what Gerhardt had said about the island, and wondered if it truly did cast a spell on us, ruining the film but ensuring the day was deeply preserved in my memory. Perhaps that day was too special to be caught on film, too light to pinned down by a snapshot, too special to become a dusty archive. In the rain forest of Costa Rica, 1996. From that day in 1996 to this, Costa Rica has always held a special place in my heart for providing all the raw ingredients for that magical day. The garden-of-eden-like natural environment, preserved by stringent eco-conscious rules, played a large part in the making of “the best day of my life.” Costa Rica was not only blessed with natural riches like dramatic coastlines, cloud forests and jungles teeming with creatures, it has also been blessed with a stable government that early on recognized that the best way to capitalize on its treasures was to preserve them. Now, many years later, I am going back to Costa Rica — but this time as a professional travel writer and a member of Eco Adventure Media. So please follow along with me here on Breathedreamgo, on my Facebook page, Pinterest, Instagram, Google+ and on Twitter by following the hashtag #EcoCostaRica or the EcoCostaRica Timeline. 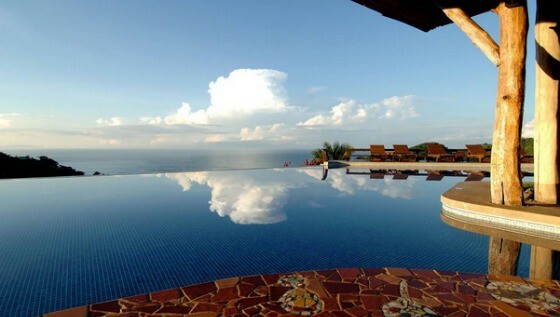 The infinity pool at Hotel Punta Islita, Costa Rica. 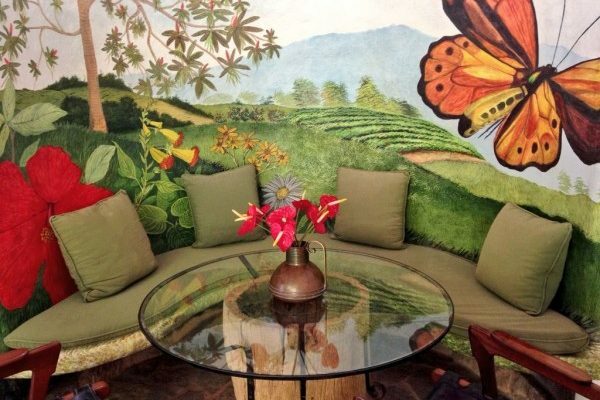 Photograph by Hotel Punta Islita.